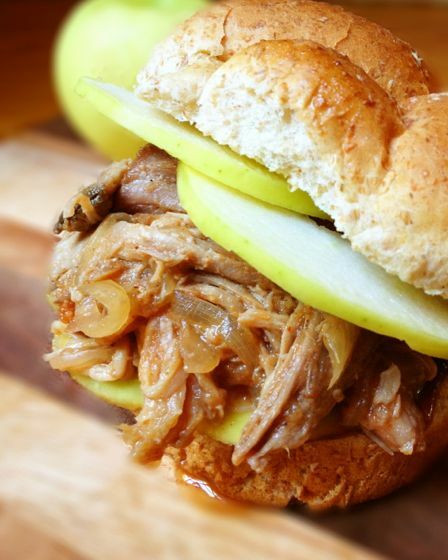 This incredibly easy weeknight slow cooker recipe combines smoky, juicy pork with sweet apples and onions to create a melt-in-your-mouth delicious pulled pork that you will be making again and again. 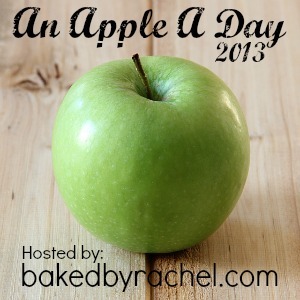 When Rachel asked me to guest post, I immediately began brainstorming apple recipes. Right away I knew that I wanted to go against the grain and create a main dish. Don’t get me wrong, I love apples in sweet dishes like my Apple Cinnamon Protein Pancakes or Apple Peanut Butter Overnight Oats but I also love using the natural sweetness of apples to complement savory meats and vegetables. Roast Chicken with Apples, Onions and Sweet Potatoes is a perfect example. Speaking of healthy made delicious, your family is going to love my Slow Cooker Pulled Pork with Apples and Onions. An incredibly easy weeknight slow cooker recipe, it combines smoky, juicy pork with sweet apples and onions to create a melt-in-your-mouth meal. This is the type of dish you will be making again and again. To maximize flavor without relying on overly sweetened, corn-syrup-laden barbecue sauce, I let the pork sit overnight in a simple dry rub of spices. 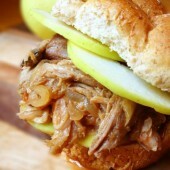 The next morning, I made a bed of apples and onion slices for the pork and topped everything with 12 ounces of beer. That’s it! The slow cooker did the rest of the work. It could not be any easier. In a small bowl, mix together spices: smoked paprika through pepper. Coat the pork shoulder with the dry rub and refrigerate for 12-24 hours. 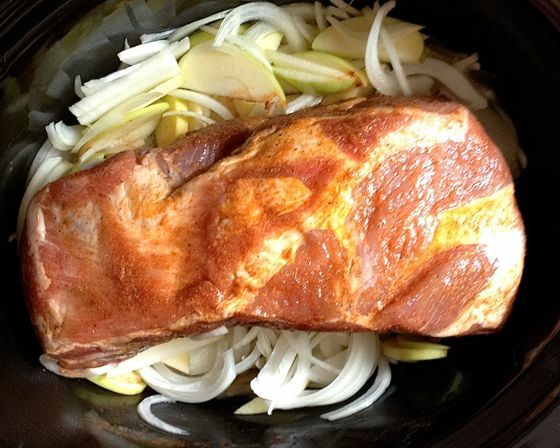 Place apple and onion slices in the bottom of a slow cooker and top with the pork shoulder. Add beer and cook on Low for 8 hours or High for 4 hours. When cooking time is complete, remove pork from the slow cooker and let rest. When pork is cool enough to handle, begin shredded the meat and disposing of any excess fat. Place shredded, lean pork meat back in to the slow cooker and mix with the apples, onions and cooking juices. Serve on a whole grain bun with apple slices. You can find Liz on Facebook, Twitter and Pinterest. Rosemary chicken breasts, Baked egg rolls with bacon and sweet chili dipping sauce and Whole wheat banana nut bread. Yes, please!! This looks just amazing! 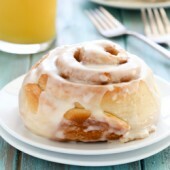 omg this is making me so hungry just looking at it!!! Liz, is the best!!! And I so want a big ol’ sandwich!! I can’t WAIT to make this! Totally up my alley. Love it, Liz. *runs to store to buy the pork shoulder* Printed! I have a tenderloin in my freezer that this would be perfect for– can’t wait to make this! Oh my gosh!! I have been re vamping my slow cooker recipes for the upcoming months today & this is perfect timing! 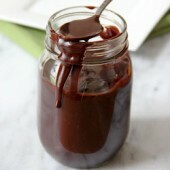 I will be making this next week! Adding to my meal plan now! Thank you so much! Oh man, this is what I’m craving right now. This combination sounds amazing. This looks like a fabulous fall meal!! Great flavors!! Slow cooked pulled pork is my favorite :) this recipe is divine!! 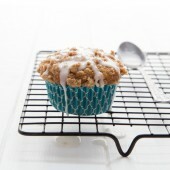 I am totally loving this recipe!! Looks so delicious! Great receipe. Thanks so much. Could i substitute chicken breasts for the pork? I imagine you could if that’s something you prefer. I can use beer or wine in cooking… any suggestions for a substitute liquid? If it’s due to the alcohol, that does cook out but there are also non-alcoholic beers you could use. However, if it’s for another reason the easiest alternative would be vegetable stock. Just be aware that the flavor will be different since the beer typically will lend some flavor to the dish. This came out very very soupy, any suggestions? Only thing I did different was use hard cider “beer” instead of regular beer. In the future you could simply reduce the amount of liquid used. Could I use gala apples instead of green apples? This was delicious! however when I made this , there was pork scum mixed in with the apples and onions.. do you recommend doing anything with the meat (ex. boil) before putting in slowcooker to get ride of the scume? Hi, What style of beer would you recommend? IPA, Porter? Thanks! This is a guest post from over a year ago so, I would use your best judgement and use a flavorful beer you enjoy that also isn’t overpowering. Can i use white wine instead of beer? I dont drink beer so i dont have any on hand. I wouldn’t recommend that as an alternative. The best substitution would likely be a stock/broth of some variety. After the pork is cooked and shredded, can I add just a bit of bbq sauce when I put it back in the crock pot? I LOVE meat cooked in the slow cooker, and I love how much volume of food you can easily make in that beast, too. I’ve also been itching to try pork and apple. So I made this over the weekend and have mixed feelings about it. I don’t like beer, and it’s fairly prominent in the end result. One sandwich does it for me. The sliced apples on the sandwich are a must for me, as I’m a bit (ha!) of a texture freak. I think if I try making this again I’ll go the route of using broth or something in place of the beer. I guess the other 5 bottles get donated to my roommate’s chili efforts. Overall, though, I suspect this would be awesome for those who do like beer. I’d just hoped it wouldn’t stand out so much. I’m so glad you gave it a try. And I’m sure your roommate will love the free beer! You may find that you’d like my apple cider pulled pork more. I agree, depending on the recipe, beer can sometimes have a very strong lingering flavor if there aren’t enough other components.